Welcome to Day Two's Recap. 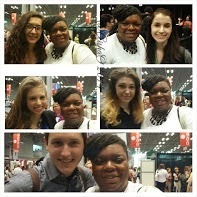 I got a lot accomplished today including meeting several of my favorite book vloggers from YouTube. I filmed this video a few times before I finally got it all together. Today there weren't any breakfast to go to but we needed to be there early so that we could check our bags in and join the line. 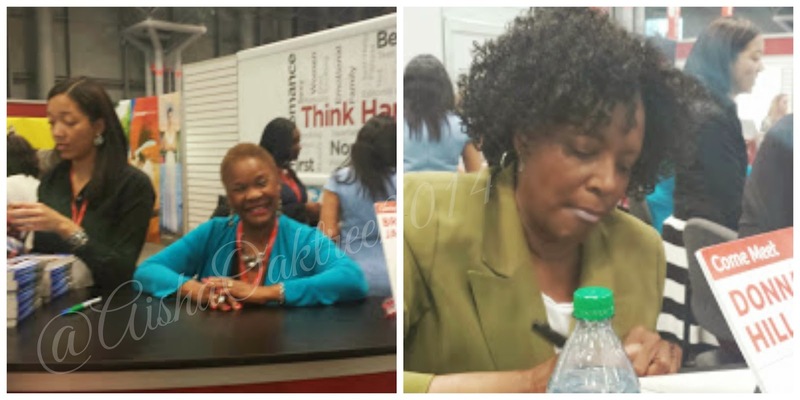 Move aside ladies and gents, Donna Hill and Brenda Jackson are signing at the Harlequin Booth. I'm not afraid to mow anyone down. 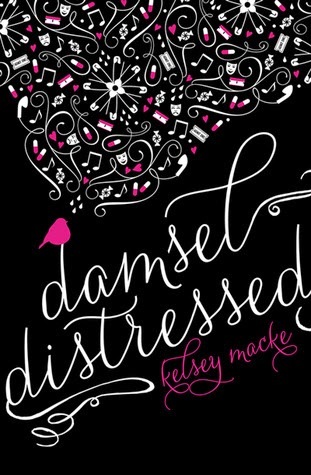 Damsel Distressed Kelsey Macke she's also a booktuber on Youtube, Make sure to check her out, This cover is gorgeous. This year Spencer Hill was the place to be and they were even better with their giveaways, because you had to have tickets and be online otherwise you lost out, They were strict and I loved them for it. The lines today were so long and so tiring. I didn't even try to join the line for Heir of Fire. I just kept walking because already people were online for at least an hour and the line kept snaking around. NOPE. I'll wait. It's not that serious. I do want to commend the BEA Staff again because today they really earned their pay. They kept those lines orderly and knew when to cut them off and made some ballsy calls when they got confronted by upset people; but I really felt like today went well because of them, they coordinated with the reps and made sure everyone was accounted for and it totally worked. Since you've been gone, which was the booksplosion book of the month. ( I learnt that when I opened up the book after Morgan signed it). This one I almost got into a little tussle with a woman over, I NEED people to understand how the buddy system works and stop getting all grouchy when I get there. I was there and went off to get other books my bags are here. I was so close to snapping at her then I just calmly pointed out that my friends had been online already and I was rejoining them. Calm own honey we're all getting books. Jesus Christos people. I hung out with the women over at Cleiss press, and learnt all about the amazing new line up. I even managed to snag a few books and I can't wait to share them all with you, Make sure to be on the look out for some sweet erotica reviews and giveaways coming up. 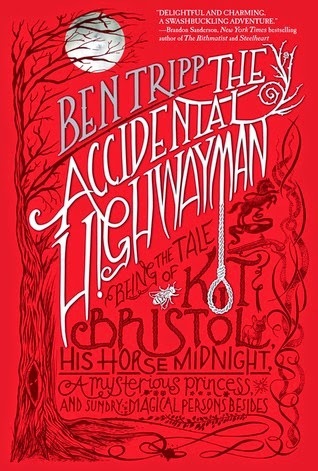 In the Press room I picked up Ben Tripp's The Accidental Highwayman. The cover of this books is gorgeous. It sounds amazing an I can't wait to dive right in. I got the book because I had it on my list and someone left it in the press room, I gave it to the monitor and she hung on to it for me and when no one claimed it by the end of the day, she gave it to me. Sweet!! 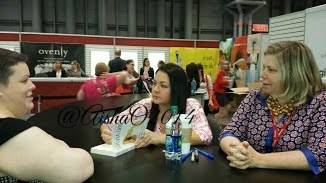 I got to meet Sylvia Day, if I'd been thinking I would have brought my Crossfire Series and gotten her to sign them . However the line was too long we didn't have any time to stop and really talk to her. 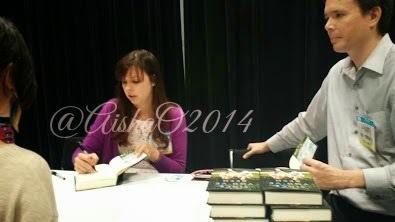 She signed and while she signed you got a few seconds to gush, then it was time to move one. My sister asked me to join the Scott Westerfeld line for her, that line was a clustereff of foolishness, it went on forever and I was like Girl I love you but no. So I joined it anyway because.. well. books. She and her new bloggie friends came over 20 mins later and I went over to Hatchette where they were serving beer. It was perfect, my feet ached, I was tired and I wanted 10 mins of silence, but that corona certainly helped. I got Elin Hildenbrand's newest Christmas book and I was outta there. I switched places again with my co blogger so she could grab a drink as well and then i stayed on line because well ..books. It ended up working out in my favor. I was the last person in line and they still had books so I went over and asked if he could sign one and the rep was like "whatevs" probably because Scott said yes before she could answer. I got five whole minutes to talk to him about his body of work and the rumors about movies being in the works for the Uglies series, which I had just begun to read. He was pretty freaking awesome. I see why people love him. He totally sold me on the new book as well. Grand Total of 57 books, 7 bags, and two kickbutt stamps. I'm both looking forward to and terrified of tomorrow. It being the thrid day and the first day of Book Con. The rumors I'm hearing of the numbers of people can't be right and I hope to the gods people are exagerating because NO. Just. No.